The Fraser fir is considered by many to be the most beautiful of Christmas trees, renowned for its blue-green color and phenomenal needle retention. 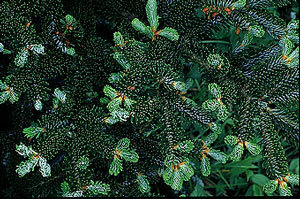 The Fraser Fir is closely related to the Balsam Fir. Fraser Firs have the same aroma as Balsam Firs, only a little less pronounced. The quality of our Fraser Fir can’t be surpassed. Grown in our Vermont mountains, this superb tree known for its deep green needles with a splash of silver underneath with great needle retention, which can be found on most of our farms. No Christmas tree lasts as long as these beauties which can also support a heavy ornament. The Vermont Fraser Fir will give your home the natural feel of Christmas you expect when you buy Vermont. Seven to ten years in the field are required to produce a 6-7 foot tree.